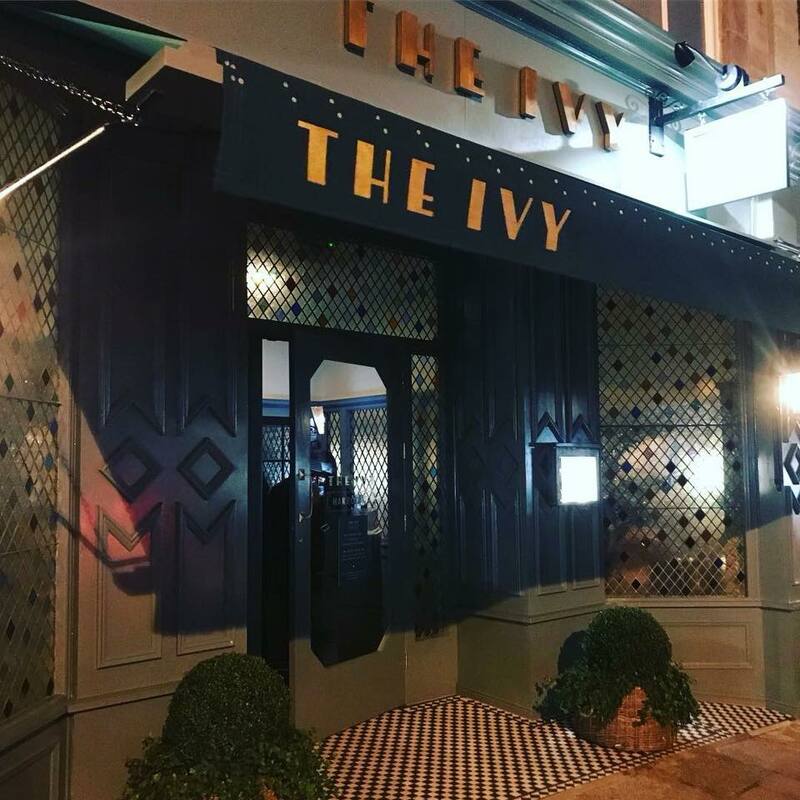 The newly opened The Ivy Harrogate has caused quite a stir, from the choice of name to the local’s movement to support indie businesses in our town. 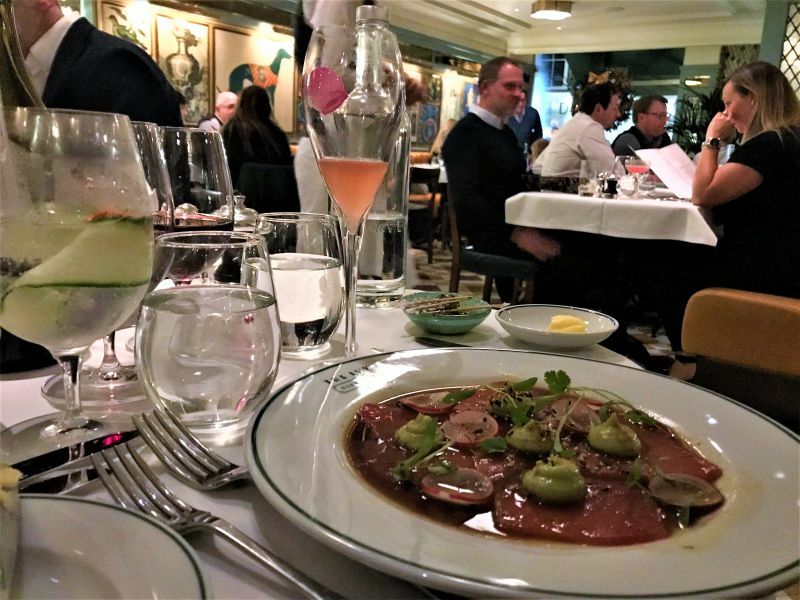 But what is it really like to dine at The Ivy Harrogate and does it stand up to other restaurants in our town? 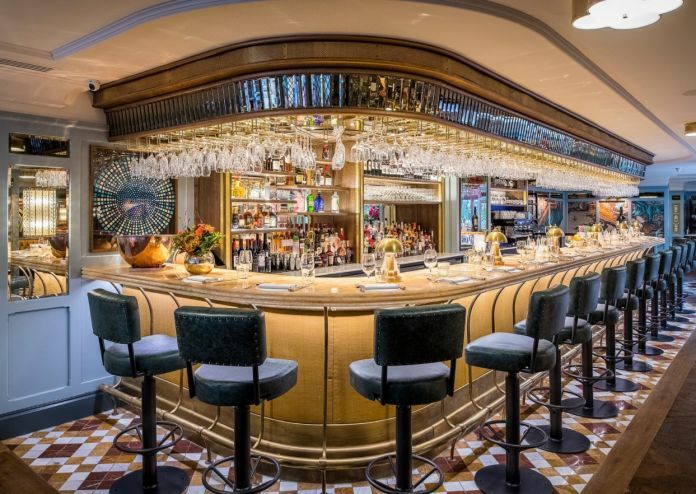 What’s the Ivy Harrogate like? From the dated Edinburgh Woollen Mill now stands an opulent double fronted restaurant, complete with Christmas green canopy and beautiful stain glass windows. Heading inside, we were greeted by ladies in red, who welcomed us in and took our coats and showed us through to our table. Inside the restaurant, the opulence continued; shades of green with pops of colour in the art which covers all walls. There wasn’t an empty table in site and the restaurant and manager, Mark said, “they’ve served 500 to 600 covers a day from 8am until 10.30pm!” over the Christmas period. It’s also been reported that 4,000 bookings were taken in the first week of opening! So, whatever the initial stir was it hasn’t deterred the people of Harrogate from booking. As we passed the bar, draped with couples dressed in their finest drinking champagne, I noticed the room was very loud and hard to hear, not the best when trying to have an intimate dinner. Our waitress for the evening was Anastasia who was extremely well trained, attentive, and knowledgeable. 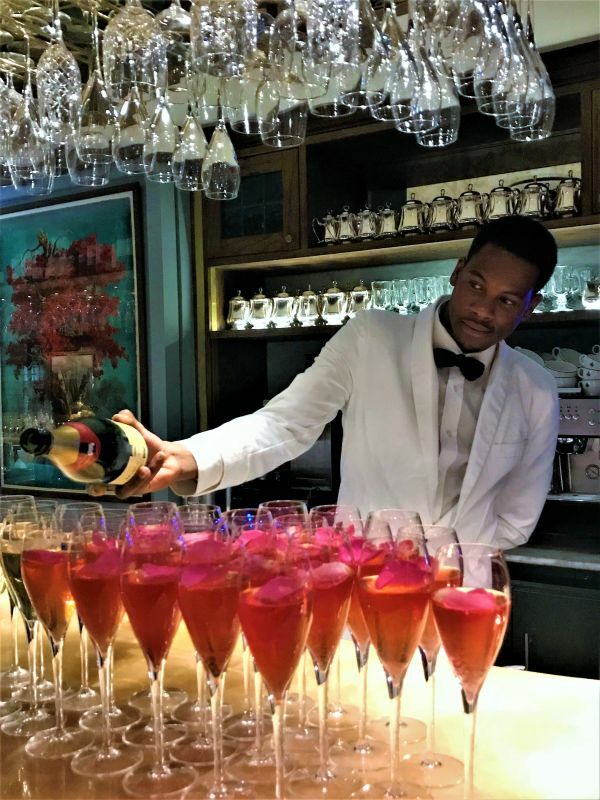 From speaking to the General Manager, Rodney, he mentioned all staff receive intensive training and most of the managers even spend time in London to learn the ropes. 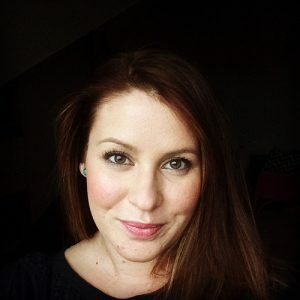 Anastasia offered her recommendations and even suggested I change my sides to better compliment my chosen main – she was right as chips wouldn’t have gone with the dish I’d chosen. Whilst we perused the menu we enjoyed a cocktail and some delicious salt-crusted sourdough bread with salted butter (£3.95) and spiced green olives (£3.50). As an avid Gin & Tonic drinker, I opted for The Ivy G&T (£8.75 – good price for a gin and Harrogate!) This Beefeater gin comes with cucumber & lime with Fever-Tree Mediterranean tonic water, and to create a bit of entertainment, they shake the cocktail at the table before poring it into a cucumber lined crystal glass and finished with a flower. Niki chose the girliest drink on the menu, a English Spa Royale (£10.25) which uses Sipsmith sloe gin, Briottet Rose liqueur & hibiscus topped with Champagne and it tasted delicious! For starter, I chose the Atlantic sea scallops (£11.95). Yes, it’s expensive for a starter but I could have had this for sterters, mains and dessert. The scallops were a medley of sweet, soft scallop meat, slightly caramelised on the top and bottom. 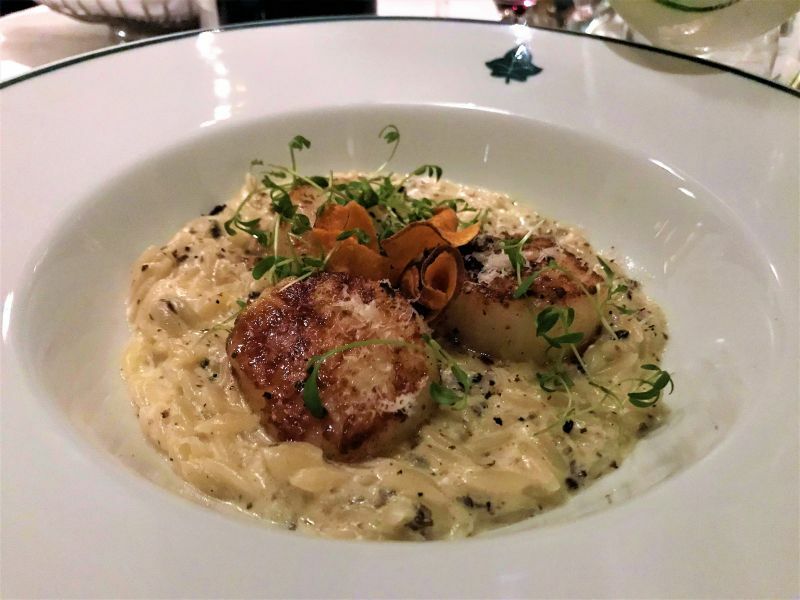 The three scallops sat upon a creamy truffle risoni, shaved Parmesan, black truffle and sesame seed notes, topped with sweet potato crisps. I’d really recommend this dish for any seafood addict. We’d finished our cocktails and wanted to try a wine, but Niki was having red meat and I was having fish, our waitress, Anastasia recommended a light red wine from New Zealand; a Pinot Noir, Spy Valley (£44.00). It had the right balance of floral notes with a subtle smokey hit, perfect to accompany a steak but not too heavy to over power a fish dish. 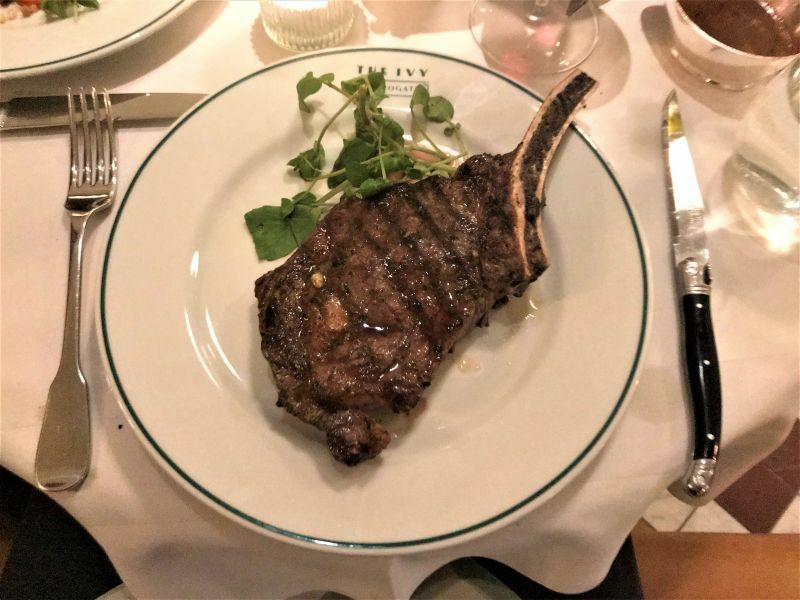 For our main course, Niki chose the Rib-eye (12oz/340g £27.95). Yes, for one steak and nothing else, this was a very expensive price to pay. But, this dry aged British rib-eye (on the bone), was super succulent, and perfectly seasoned. We ordered thick cut chips (£3.50), and tenderstem broccoli in lemon oil and sea salt (£3.75) to accompany the steak. Although I can’t fault the actual dish, I’ve been to similar places where the total dish does reach the dizzy heights of £35.20! 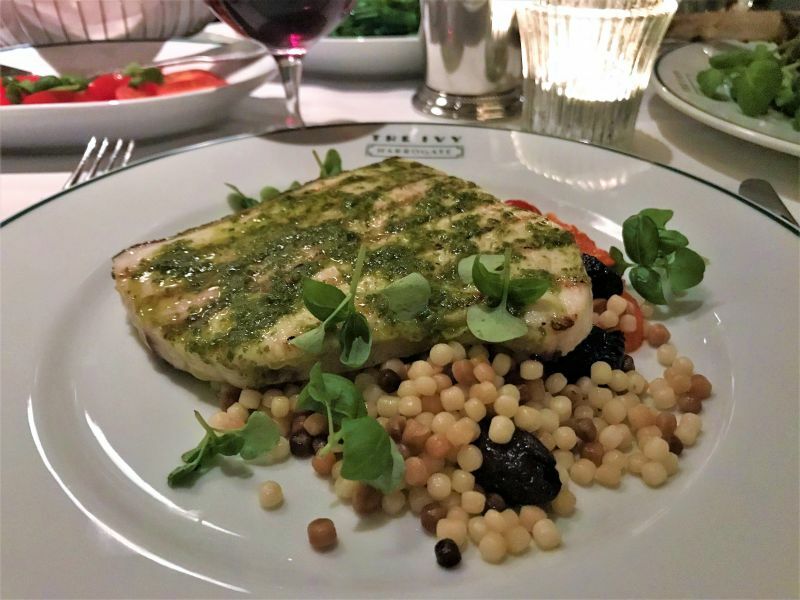 I ordered the line-caught swordfish (£15.50), which came with a red pepper sauce, Provencal black olives, fregola (a type of pasta from Sardinia) and chimichurri dressing. The flavours were really good and the fregola was delicious. Sadly the swordfish was a little dry for me; it didn’t take away for the experience and I think it’s personal taste as I would like it a little pink on the inside. I ordered San Marzanino tomato and basil salad with Pedro Ximenez dressing (£3.95), a recommended swap for the chips by Anastasia – thanks! As a chocolate lover, I was intrigued by the chocolate bombe (£8.50). Anastasia brought it to the table before pouring hot salted caramel sauce over the chocolate ord. The melting chocolate bombe uncovered a creamy ball of vanilla ice cream and honeycomb. This rich dessert is any a chocolate lover’s dream. The salted caramel cuts through the sweet chocolate while the ice cream added a creamy loveliness. Please forgive me for the film being so dark, I know I need to get proper lighting! I think Niki chose very well. The apple tart fine (£7.95) is a baked apple tart with vanilla ice cream, which is Calvados flambé at the table! The desserts really were showstoppers! Overall, the starters and puddings were our favourite dishes of the meal. The total cost of our meal came to £153.20 and for what we had, combined with the impeccable service and beautiful surroundings, I feel this is a reasonable price to pay. 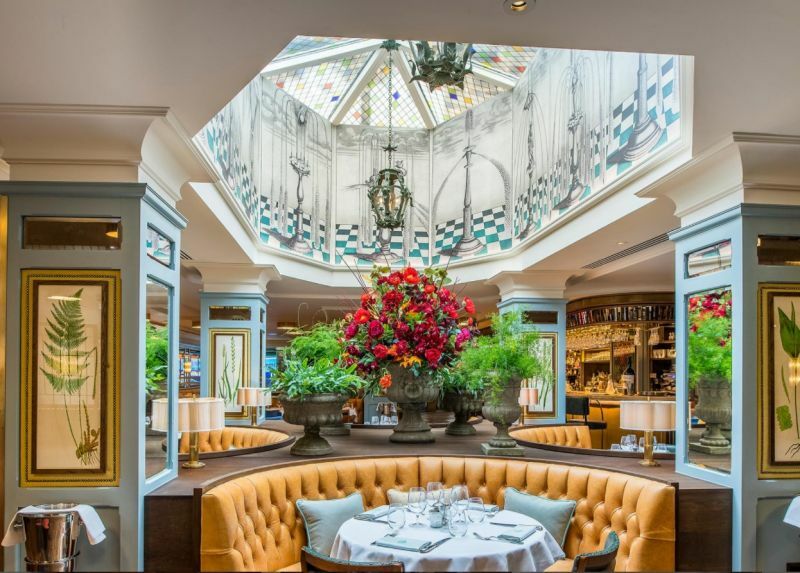 However, I know it’s still very expensive so you’ll be pleased to know The Ivy also offer a three course meal before 6.30pm, Monday to Friday, for just £21.00. This offer is cheaper than some of the other restaurants in the area and, if it’s the same standards as what I tasted it’s more than worth a try! 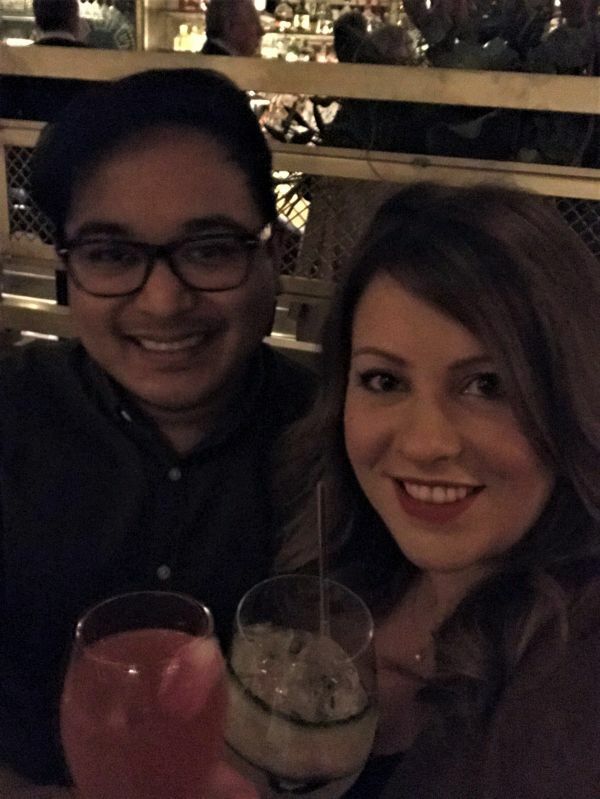 It was so nice to be out with my man in Harrogate, and even with it being a little noisy, The Ivy Harrogate really does deliver a great night for couples. 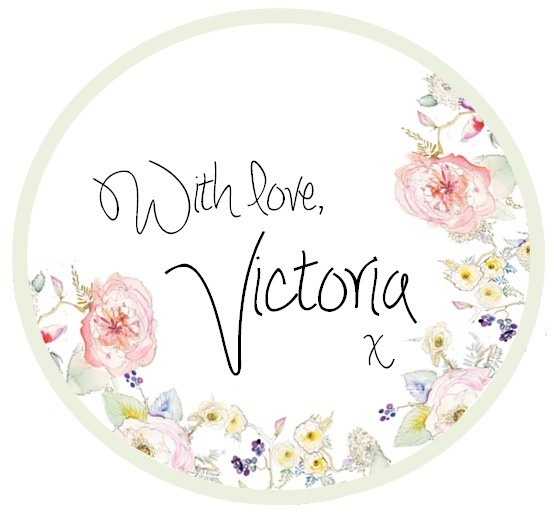 I wish them the very best in Harrogate and know they are trying really hard to bed into the community and be active within it. 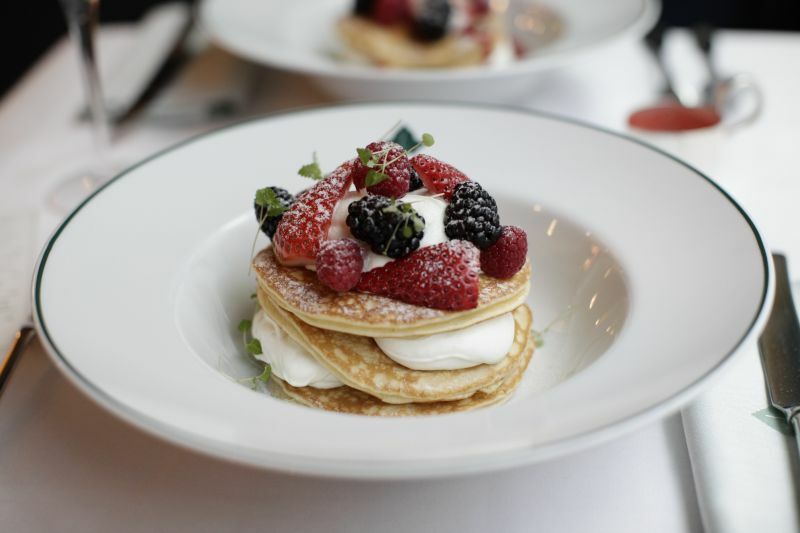 This Pancake Day, Tuesday, 13 February, celebrate with friends and family at The Ivy Harrogate. For one day only, two mouth-watering options will be available all day for guests to enjoy including; classic buttermilk pancakes (£7.95) with lemon, sugar, Greek yoghurt and lemon balm, and hot buttermilk pancakes (£8.95), with strawberries, raspberries, blackberries, Greek yoghurt, lemon balm and a warming strawberry sauce. If you liked this post you might also like my post about staying at the Feversham Arm’s in Helmsley. Read more here. P.S. 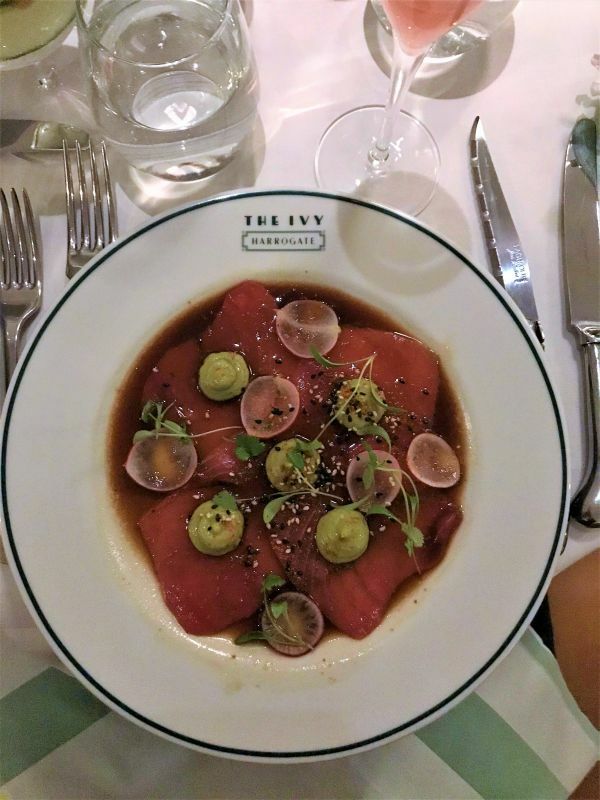 Thank you ever so much to The Ivy Harrogate for inviting Niki and me to review the restaurant.